Natural beaver fur blanket from Canadian beavers "Winter Dream"
Discover our Canadian beaver fur blanket made from real beaver skins. 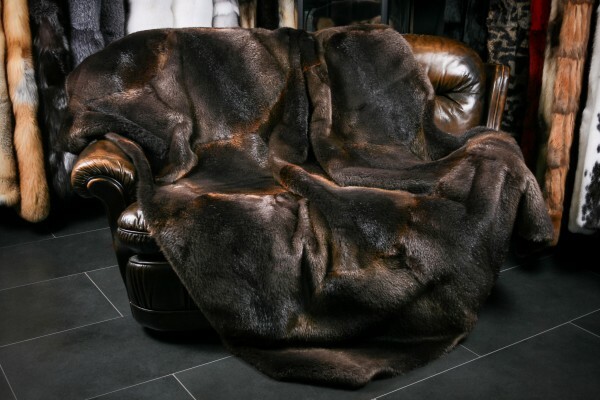 We used high-quality Canadian beaver skins to guarantee the quality and manufacturing of this fur blanket and to ensure you will be just as satisfied as we are. The furs for our Canadian beaver fur blanket origin from the renowned Fur Harvesters Auction. We chose to back lining that matches the color of the fur blanket perfectly. Of course, we gladly craft the fur blanket in the size of your desires. Related links to "Fur blanket from Canadian beaver skins "Winter Dream""
Customer reviews for "Fur blanket from Canadian beaver skins "Winter Dream""